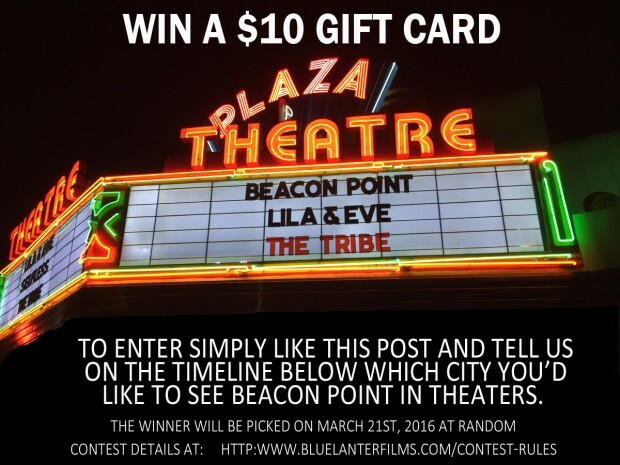 Enter to win a $10 Amazon Gift Card by Liking our Facebook Post and leaving a comment on which city you’d like to see our movie, Beacon Point, have a theatrical release. For example, Atlanta. The winner will be chosen on March 21st, 2016. The winner’s name will be posted on the Beacon Point Facebook page and privately messaged about how to claim the $10 Gift card. ENTER TO WIN A FREE LOST CROSSING DVD! Rules/Disclaimer: This promotion is open to those 18 and above in the United States, Canada, United Kingdom, and Australia. Void where prohibited. No purchase necessary. By “Liking” and “Commenting” on this post you enter and agree that this promotion is in no way associated with, administered by, or endorsed by Facebook; and acknowledge a complete release of Facebook by your participation. The $10 Gift Card will be chosen at random by a 3rd party application on March 21st, 2016. If a winner is chosen and they do not respond to Facebook messages within 5 days, a new winner will be chosen at random. A minimum of 50 posts must be obtained before a prize will be awarded. If there are less than 50 posts are received by the contest deadline, March 31st, 2016, then the contest is void and no prize will be awarded.